After snacking at the Bar Ferdinand fest (it was somewhat early), we wanted real food. 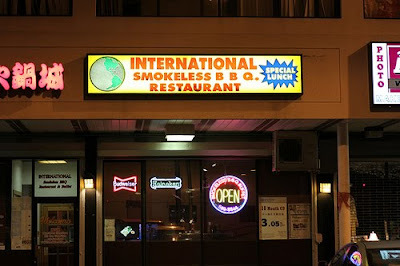 We took a little drive over to Washington Ave and ended up at International Smokeless BBQ Restaurant. H/A’s friends were there, so we just crashed. I’ve seen this place dozens of times before as it’s in the same vietnamese strip mall as pho ha. But it’s not exactly very inviting, you know? 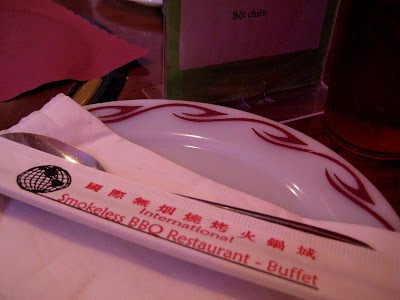 So they specialize in all you can eat, cook your own, meats and hot pots. Seafood too. And a salad bar that comes with your unlimited grub. None of us were in the mood to actually do that, so we just got food from the regular menu. The regular menu is a little schizophrenic. There’s viet dishes, chinese, thai, japanese. It basically runs the gamut to cover all your east asian favorites. 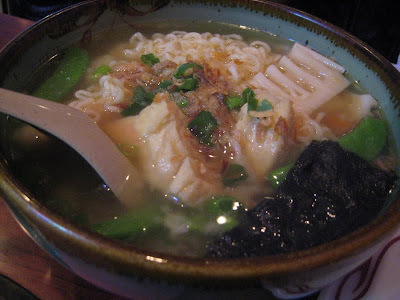 T got the vegetables in miso soup, which was basically ramen in a miso broth, loaded with veggies. 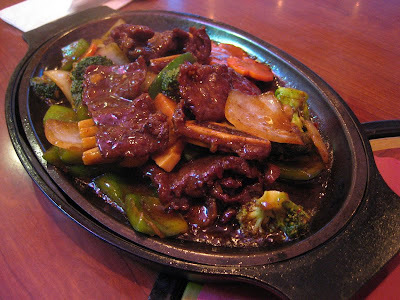 H/A got the sizzling beef. It looks like korean bbq, but it’s not exactly that. I don’t think it’s supposed to be either. It still tasted pretty good, but the flavor was definitely slightly different. I loved the onions in it though, and I stole them all. 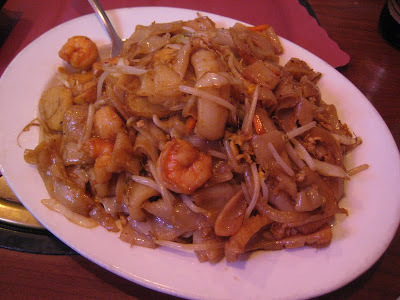 I got a chow fun (wide rice noodle) with seafood dish. The quality of the seafood wasn’t the greatest, but it was still a decent dish. It was tons of food though. Most of it went untouched. One of H/A’s friends had a birthday, so there was also some cake. 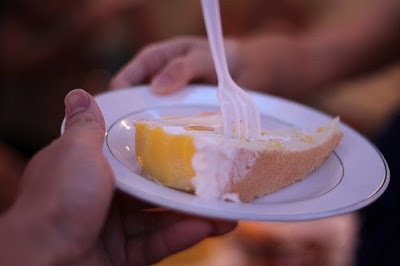 It had mangoes on it. I ate this like I hadn’t eaten all day. I’m thinking that one day, when I’m feeling particularly carnivorous and ravenous, I will stop by to try some of the all you an eat.